Annual geraniums are popular indoor and outdoor flowering plants. The variety of flower colors, leaf shapes, colors, and growth habits make this plant ideally suited for home landscapes. These versatile plants are excellent as annual bedding plants, in hanging baskets, and in containers. Annual geraniums are not actually "true" geraniums as they are members of the genus Pelargonium. True geraniums are perennials in the genus Geranium. Common garden or zonal geraniums (Geranium x hortulanum) are widely sold as bedding or container plants. Many have distinct, dark markings or bands (sometimes called zones) on their leaves. Flowers are borne in large, showy clusters and may be single or double. Flower colors include red, burgundy, lavender, pink, salmon, orange, white, and bicolor. Ivy geraniums (Geranium peltatum) have ivy-shaped leaves and more vine-like or trailing growth habit. Flowers can be single or double and are available in colors similar to the common garden geranium. Plants perform well in hanging baskets and window boxes. Ivy geraniums are somewhat less heat tolerant than common garden geraniums and benefit from some afternoon shade. Scented geraniums consist of several species, selections, and Pelargonium hybrids. Plants have a wide range of leaf sizes, shapes, and colors. Leaves are normally scented (hence the name) with lemon, rose, peppermint, nutmeg, apple, oak, and other fragrances. Scented geraniums are excellent container houseplants. Flowers are normally white, pink, or lavender and are typically less showy than most other geraniums. 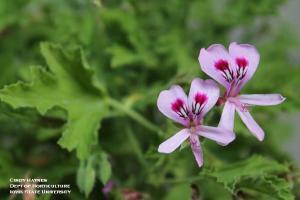 The widely promoted "mosquito geranium" is a type of scented geranium. When the leaves are rubbed, brushed, or crushed, a citronella fragrance is released. Since the citronella oils are only released when touched, plants growing in containers on a patio or deck do not repel mosquitoes. Martha Washington or regal geraniums (Pelargonium x domesticum) are the cool-season annual geranium. This group is noted for their large, ruffled flowers in white, pink, red, purple, yellow, burgundy, and bicolors. Since these geraniums thrive in cooler temperatures, they are normally only sold as container plants in late winter or early spring. While they make wonderful houseplants for several weeks, they are typically discarded when flowering is complete. 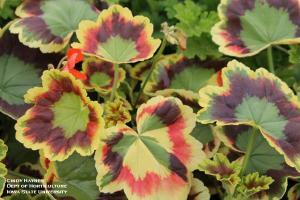 Fancy-leaf or variegated garaniums are becoming popular in some areas of the US. They are selections or hybrids from the common or zonal group of geraniums that are noted for their distinctive, multi-colored foliage. Combinations of green, yellow, white, red, burgundy, bronze, or coral leaves make these attractive plants for both indoor and outdoor containers. Some have scented foliage. Plants have red, pink, lavender, or white flowers, but they are smaller and less showy than the common garden geraniums. Planting times and sites - Annual geraniums should be planted outdoors after the danger of frost has passed. This is generally mid- to late-May in much of Iowa. Most geraniums prefer moist, fertile, well-drained soils and full sun (at least 6 hours of direct sun per day). Flowering will be reduced in areas that receive less than 6 hours of sun. 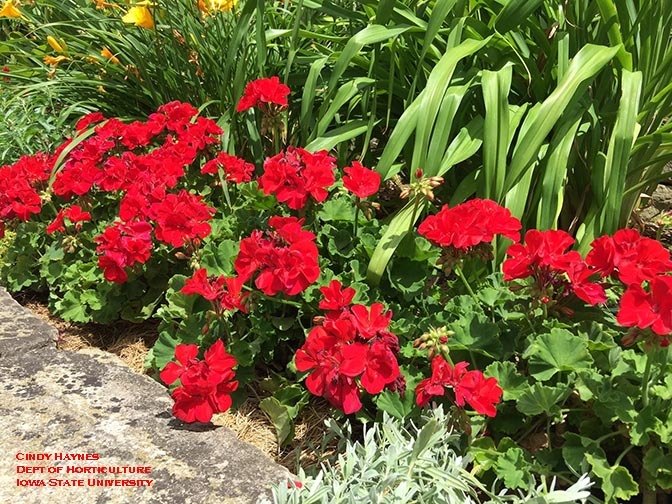 Water and fertilization – Geraniums growing in containers require frequent watering as often as two or three times a week in hot, dry weather. Geraniums in ground beds and borders require approximately one inch of rain per week. For best performance, water once a week during dry periods. When watering, avoid wetting the foliage as this may promote disease development. Almost all geraniums benefit from regular fertilizer, especially those in containers. A dilute solution of a water-soluble fertilizer applied once or twice a month during the summer is ideal. Encouraging more flowers – Geraniums benefit from regular deadheading (removal of spent blooms). Deadheading promotes the production of additional flowers by preventing seed formation. It also improves overall plant appearance. 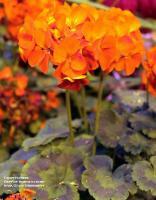 Overwintering options – Geraniums can be kept indoors over the winter as container houseplants. They need bright light near a window, moderate temperatures, and regular watering. Another overwintering option for the common garden geranium is to store the geraniums as bare-root plants. Lift plants from ground beds or containers in fall before the first frost, gently shake the soil from the plant's roots, and place the bare-root plants in a large paper, grocery bag. Store the geraniums in a dark, cool location (around 50 – 55 degrees F) for most of the winter. In March, remove the dead stem tips (cut back to firm, green stem tissue) and plant what is left in containers. Place containers in a sunny window and water as needed. Plants can be planted outside in May. Common geraniums on the Iowa State University campus. Links to this article are strongly encouraged, and this article may be republished without further permission if published as written and if credit is given to the author, Horticulture and Home Pest News, and Iowa State University Extension and Outreach. If this article is to be used in any other manner, permission from the author is required. This article was originally published on June 23, 2017. The information contained within may not be the most current and accurate depending on when it is accessed. Is it necessary to fertilize annuals growing in containers?